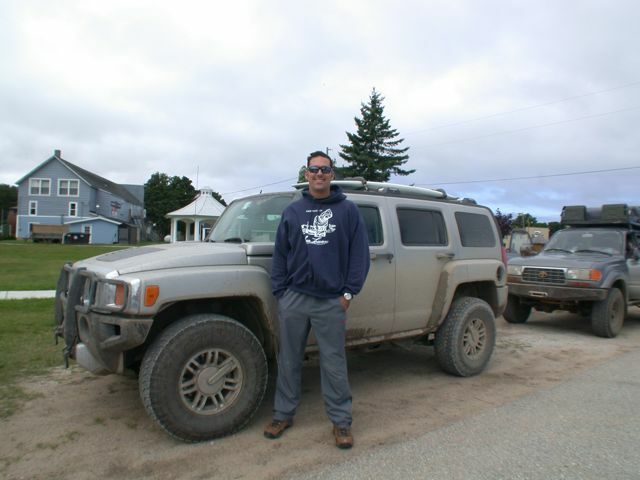 8/20-24/2009 I got the opportunity to take part in the 2nd Annual Upper Peninsula Overland Adventure planned and executed by Upcruiser and Northern Explorer through Expedition Portal and like last time it was a blast. This trip was an expedition type of off road excursion aimed more and exploration than technical four wheeling. For anyone who wants to learn more about expedition four wheeling, checked out www.expeditionportal.com. The link above will take you to the trip report. However, you can research the planning thread as well. This site typically requires registration. The actual trip itself took place from August 21st to August 23, however, there was an optional first leg that added two days to the beginning of the journey. Due to the distance from the Chicago suburbs to the staging and finishing areas I required two extra days just to get there and back so I only did the main trip. Since the drive up was uneventful we'll pick after leaving the staging area in Marquette's Lower Harbor where the local news station 6 covered the trip. Some Day 1 Video can be seen here. This video was taken by Pad and includes footage from the option part of the trip. 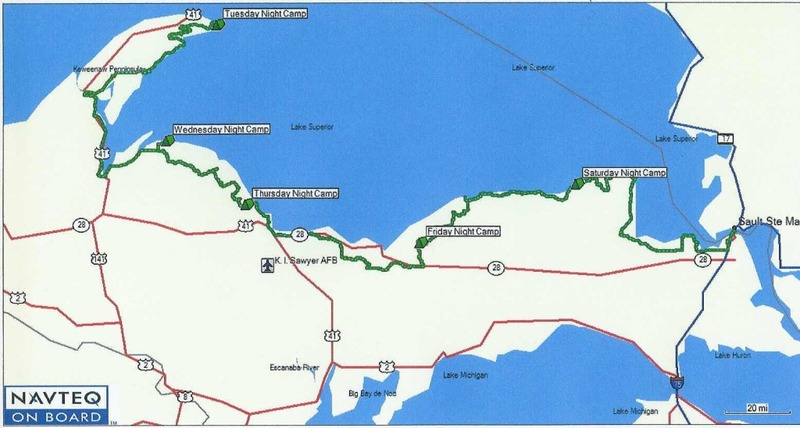 This picture courtesy of Northern Explorer shows the entire route. I was able to meet up with the group in Marquette and stayed at the location "Thursday Night Camp". I thought I take a bit of a different approach with this trip report and include video in between the pictures. featuring music by the Lobster Tank Divers shows a lot of the terrain and weather we encountered. The following pictures are taken from a lookout at Picture Rock. In case anyone didn't notice, I brought my surf board. I was feeling good about the waves rolling in. We traveled along a mixture of dirt, occasional paved, and 2 track forest roads. It was raining, hard at times, and had been since the night before. As a result, there were many mud puddles in our path. We went through forests, prairies and the likes. It was very scenic. Before setting up camp, many of us took a trip into Munising for lunch and refuge from the wind and rain. After that we gassed up and headed to our camping spot. The weather was worsening which was a blessing and curse for me. I learned a lot on this trip about how to better brave the elements. After soaking my jacket and clothing through I finally constructed a bit of a shelter for my tent and chair. With the wind whipping and blowing like it was it was not easy to secure the tarps so they would stay in place. Finding the right arrangement to keep the tent mostly dry was no easy. Nevertheless after 3 attempts I pretty much got it right. I changed into some dry clothes and decided to pour myself a nice stiff rum and coke. The group for the most part remained huddling their respective shelters for the next few hours until the bulk of the rain passed over. That night the rain did move on and the group was able to enjoy dinner and some time around a warm campfire. With the Hummer all packed up and ready to move on we headed out the next morning. We would again see many 2 track forest roads and great scenery. As the day moved on, the weather improved. with some shots from our camp the first day. This video should settle any debate as to whether or not one can surf the Great Lakes. I'll admit, from the looks and occasional comments, people were / are not use to seeing a Hummer with a surfboard putting around the U. P.
One of our first stops was this lookout. We were actually headed passed this point you can see below to the east. The view was great. The wind was very strong here. If you stood against the railing you felt like you'd get blown over but take two steps back and you hardly felt it. Some of the group chose to do a bit of site seeing while they had lunch while others chose to head directly to Gran Marias for lunch. Since I needed ice I decided to head to Gran Marias and pick up a few other supplies while I was at it (gotta have brats). That Eagle in the picture was great to follow. I used to love AMC's when I was in high school and it was excellent to see one hitting up all these puddles and trails. After leaving Gran Marias, we headed off pavement for about 1-2 hours. We stopped at one point so people could pic blueberries. As we approached the beach we spread out and selected camp spots. By this point the weather was excellent and the winds weren't too bad. Here is night two's camp. This provided a great opportunity to dry things out. Another view. I really love camping on the beach. After some time I just couldn't take it anymore I had to surf or at least try. There are a lot of nay sayers out there as far as Great Lakes surfing goes and I'll admit I was one of them. I'm not anymore and the following pictures and videos should explain why. The wind was backing off a bit and the waves were starting to organize so out I went. This would be the first time I surfed this board, surfed in fresh water, and used this wetsuit. Lots of firsts! 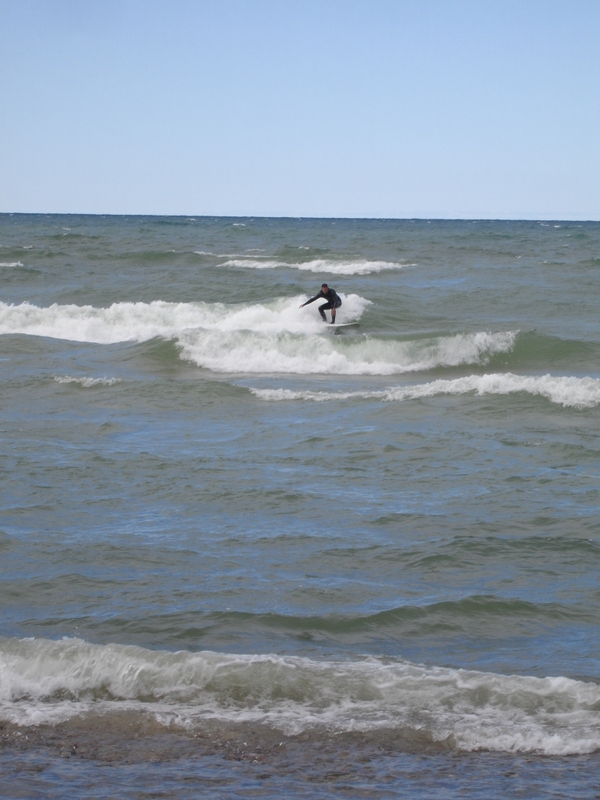 So, as you can see, there is in fact surf on the Great Lakes and it can be pretty fun. My 8' 7" dropped in fine and surfed like I had owned it all my life (what more could you ask from a new board?). I can't wait to get back into the water. Unsalted foam was a first, almost sweet tasting compared to what I expected after pushing through the first wave on my way out. After surfing we decided to get the camp site going. Below is Flex the dog. He was lots of fun. He belonged to Tom and the Eagle and was a cool dog. Flex made me wish I had brought my dog Ginger along. This picture shows the sun setting through the kayaks and trees. I didn't now we'd get to see the sun set over water but we did and it was a really pretty sunset. I used to take sunsets over water for granted, but not anymore. I took a ton of pictures of the sunset so there are a sample. That night we cooked bratwursts, marsh mellows, all the good stuff. I was so full. It was nice to sleep listening to the waves crash. It reminded me of home (San Diego) . This little corner of the U. p. is yet another I would like to visit again and stay for a few days. The next morning UPCruiser and Northern Explorer held the raffle. This was the best kind of raffle where it's not if you win but what. There were about 3.5X more prizes than people. After that we headed out. We found ourselves on more sandy terrain some of which we a bit thick. Our first major stop was the Crisp Point Lighthouse. This lighthouse had been nicely restored and you could climb up to the top of it. The picture below is the view to the west I think. The pier blocks are remnants of docs that use to be there. The days journey was to end at Sault Ste. Marie. Given the timing I decided to break off from the group here because by doing so I could make the drive back to Chicago in one day. Otherwise, I'd need to spend the night somewhere in between because 8 hours of wheeling and 8 hours of on road driving get to be a bit much. These trips are so much fun, I always end up wishing I could take another as soon as I get home. The U. p. has so much to explore and adventure to be had. Much of the scenery reminds me of coastal northern California. It's very wooded and hilly while Illinois is very grassy and flat. If anyone who reads this thinks they might like to make a trip up this way, check on Expedition Portal, I'm sure next year's trip planning will begin in a few months. I'll definitely be on the look out for the next planning thread. Off roading is in itself a ton of fun. But hopefully one can gather from this trip report how many other dimensions of what appears to be on the surface, a vehicle only sport, really has. The same truck that can be a blast at the off road park and take you places you just can't get to any other way in an amount of time your job will let you off of work. You meet people and make friends at every turn. It's a side of life worth living if you hear the call. That's it for this trip, can't wait to do it again next year!! !